Since 2002, Morpheus has been generating consistent profits through a simple and proven swing trading system for stocks and ETFs that works in up, down, and sideways markets across the globe. Depending on market conditions and type of swing trade setup (detailed below), we seek to hold our trades from several days to several months. In steadily trending markets, we aim for an average share price gain of 20-30% for each stock trade (10-15% for ETF trades). Many active traders make the mistake of assuming a winning strategy for swing trading stocks needs to be complicated. On the contrary, we have found simplest trading strategies are the best because they can be more easily and consistently followed without confusion. Using actual past trades entered in The Wagner Daily letter, below we explain and illustrate the technical criteria behind each specific type of trade setup. 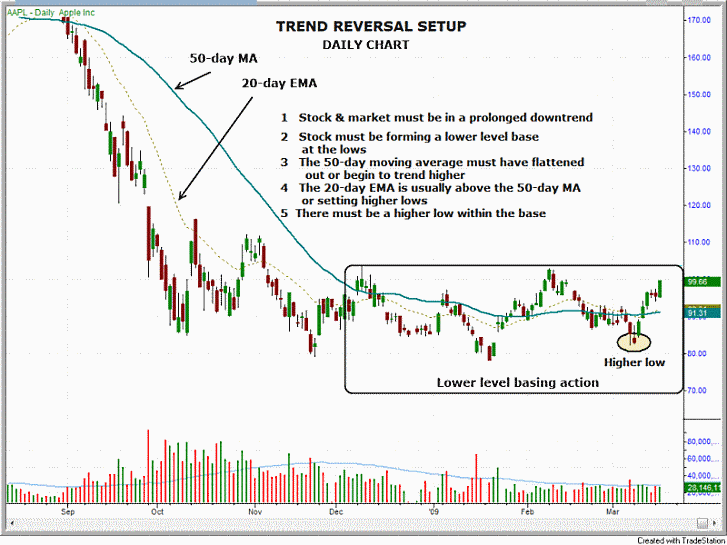 In healthy, uptrending markets, a vast majority of the stocks and ETFs we buy are momentum-driven breakout trades, each of which must first possess a valid basing pattern such as a "cup and handle" or flat base (click here to learn how to identify these chart patterns that precede the best breakouts). 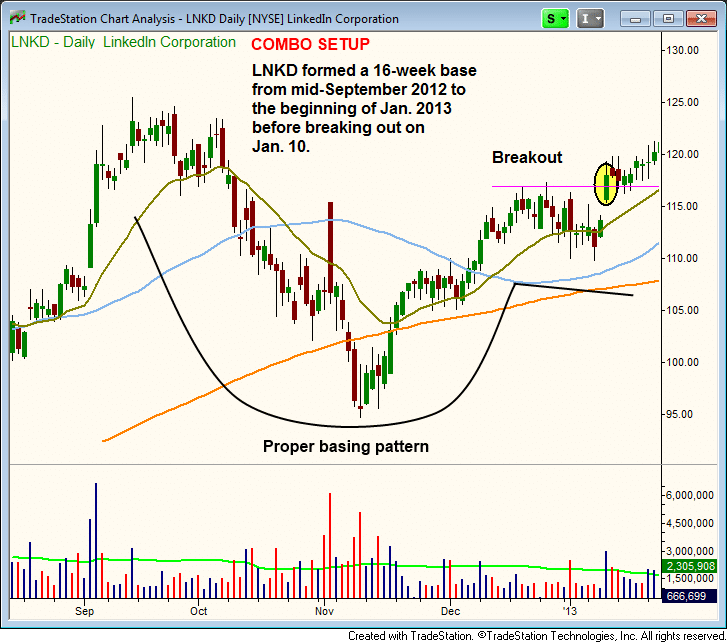 The stock must have a combination of strong earnings growth and some type of technically bullish chart pattern. Typically, these stocks are growing their earnings at a rate of 30 to 40% (or more) quarter after quarter. Furthermore, these stocks usually have an IBD relative strength rating of 80 or higher. Since we consider these stocks to be "A-rated," they can usually be held for at least one to two months (longer holding periods often lead to larger profits). Overall, the Morpheus Combo setup is one of our top swing trade setups because the combination of a bullish chart pattern and strong earnings growth frequently leads to powerful, high-momentum breakouts (which translate to rather profitable trades for our subscribers). 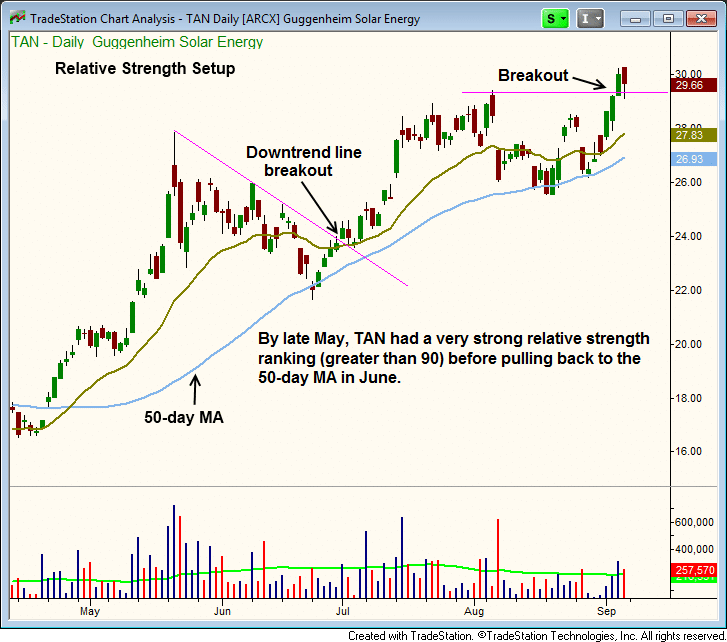 With this swing trade setup, earnings growth is not important, but the stock or ETF must have a top relative strength rating (95 or higher) and belong to an industry sector group that is outperforming the S&P 500. These stocks/ETFs are usually held from one week to a month or more. Our Relative Strength setup is the main trading technique discussed in Deron Wagner's popular book, Trading ETFs: Gaining An Edge With Technical Analysis. 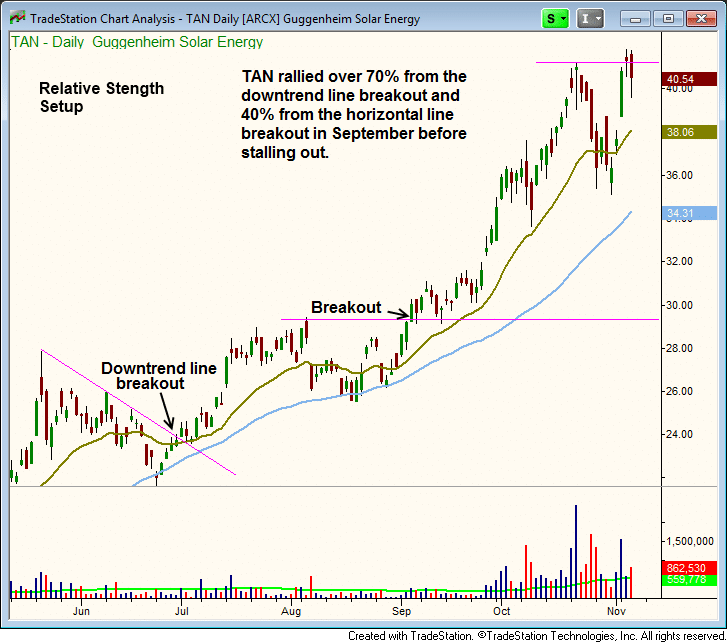 In our swing trader newsletter, we scored an actual 44% share price gain on the $TAN rally shown above. A detailed analysis and walk-through of that trade can be found in this blog post. 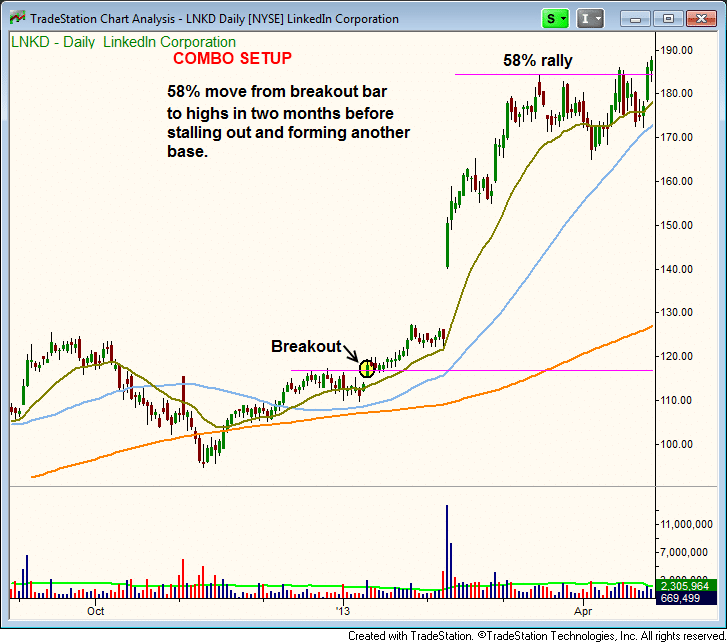 Neither earnings growth nor a top relative strength rating is necessary with this type of swing trade setup. Instead, we are simply looking for a monster volume spike on the daily chart, combined with a 4% or more gain the same day. Such a huge gain on a sudden surge in volume indicates institutional demand. Whenever demand is sharply greater than supply, the price of a stock/ETF has no choice but to rocket higher (which is why volume is one of the best, most reliable leading technical indicators). 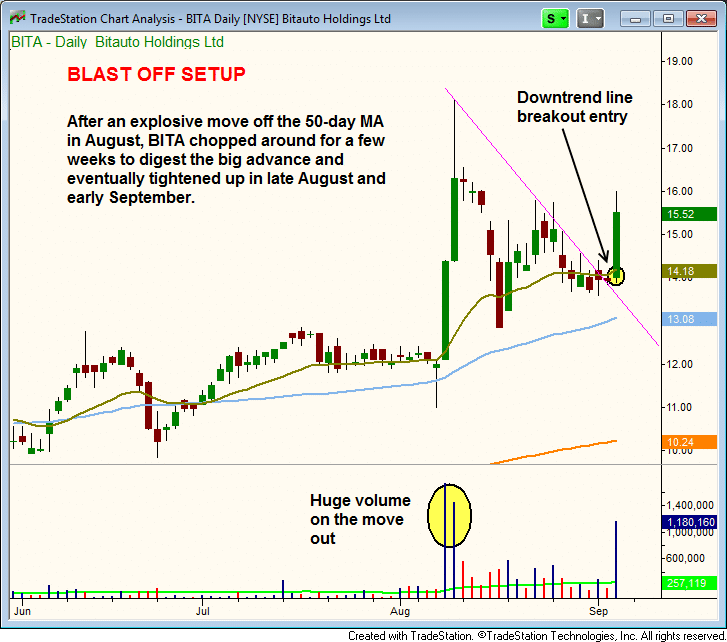 With this setup, the one-day volume spike should be at least 2.5 to 3 times greater than the 50-day moving average of volume. These stocks can be held for a few days to a few weeks (as long as the price action remains overly bullish). With our trading system, we never try to catch bottoms, nor sell at the absolute top. Rather, we simply aim to catch "the meat of the move." 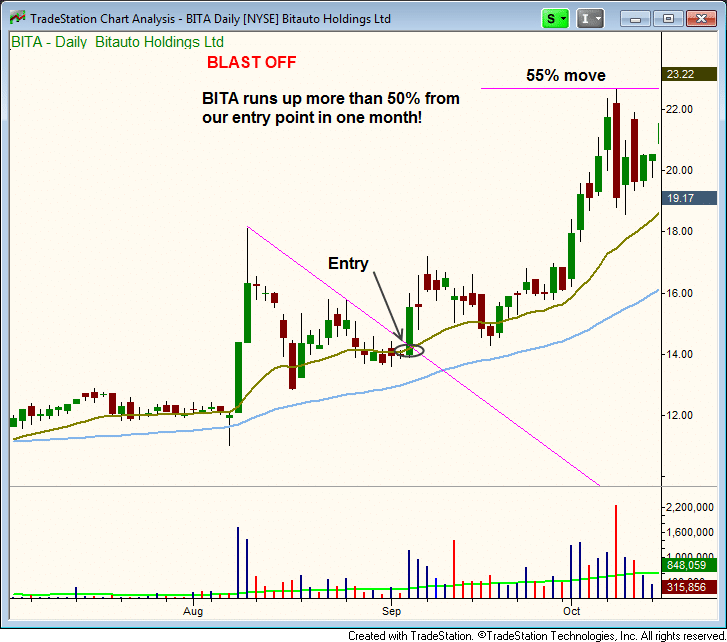 In the case of $BITA, we netted a 37% gain from holding the stock just four weeks (more detailed review of this trade can be found here). 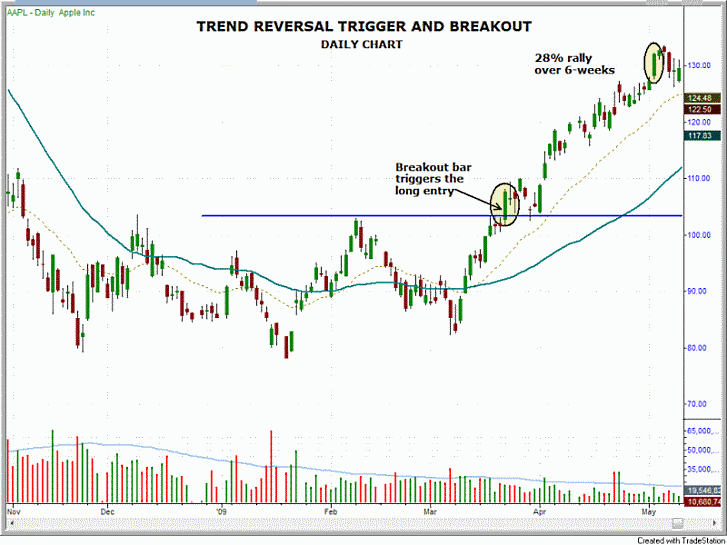 As previously mentioned, an overwhelming majority of the stocks and ETFs we trade in strong, uptrending markets are breakouts (one of the three types detailed above). However, we also buy pullbacks of strongly uptrending stocks/ETFs when they retrace to key near-term support levels (such as the 20-day exponential moving average). This is a great way to buy a stock or ETF that we initially missed due to a sudden and/or unexpected breakout. Click here to see several examples of actual pullback trades we have taken in the past, including brief videos that clearly explain our pullback trading strategy. Whereas the Breakout and Pullback setups are only bought when the S&P 500 and/or NASDAQ is already in a steady uptrend, it is not necessary for the major indices to already be in a confirmed uptrend when buying a Trend Reversal. Furthermore, the Trend Reversal setup should NOT be used in a healthy, bullish market because it would merely identify stocks and ETFs that are lagging the broad market (relative weakness). Again, this type of trade setup is only used if the main stock market indexes are in the process of reversing a lengthy period of weakness. In flat or downtrending markets only (never in an uptrending or bullish market), we also sell short stocks and ETFs with relative weakness, after they breakdown below support and subsequently bounce into resistance. This is known as Short The Bounce. Details and a clear example of this strategy can be found on this blog post. As technical momentum traders, we do not believe in the Wall Street mantra of "buy low and sell high." Instead, we seek to "buy high and sell higher." Stocks and ETFs in strong uptrends that have outperformed the market over a 6 to 12 month period have a high probability of continuing their bullish trends for the next few months. As Sir Isaac Newton once proclaimed, "an object in motion stays in motion until a greater force acts against it." Similarly, stocks trading at or near their 52-week highs have the least amount of overhead resistance to work through, and can therefore stay in uptrends longer than anyone expects. Ideally, the best swing trading candidates will be trading at 52-week highs and fresh all-time highs, as they have no overhead supply (resistance) to work through. For this reason, we focus on buying stocks and ETFs trading within 20% of their 52-week highs (in uptrending markets only). One common and deadly mistake new swing traders make is "bargain hunting," which is going after stocks and ETFs that have fallen out of favor in the market and are usually trading at or near their 52-week lows. The (faulty) thought process is to "simply" buy the lows, wait a while, and sell higher. However, this is a flawed plan for traders because market trends frequently last much longer than anyone expects, and it is human nature is to underestimate how long a trend can last. Therefore, it makes no sense to buy a downtrending stock (or sell short an uptrending stock). Because approximately 80% of stocks follow the direction of the dominant market trend, all swing trade entries are also in sync with our rule-based stock market timing model. This enables us to achieve strong gains in healthy, uptrending markets, while seeking to avoid losses (or profit from short selling and trading inverse ETFs) in flat to downtrending markets. We trade a mix of both stocks and ETFs, the ratio of which is dependent on market conditions. In bullish, uptrending markets, our main focus is on trading small to mid-cap growth stocks because they have the best capability to outperform the gains of the broad market. However, in flat or downtrending markets, we shift our focus more to trading ETFs because they can provide us with a low correlation to the direction of the broad market (currency, commodity, fixed income, and international ETFs). We also trade inversely correlated ETFs ("short ETFs") to achieve outperformance in downtrending markets. Knowing the right time to buy stocks and ETFs is only one part of the equation to becoming a successful swing trader. Obviously, knowing when to sell is at least equally as important. Generally, the main goal of our exit strategy is to sell winning trades into strength when they have achieved a reward-risk ratio of at least 2 to 1. That means the trade has gained at least double our initial capital risk. However, when the trade doesn't go as expected, we calmly exit into weakness because not all trade setups work and we always employ firm risk control. With each and every trade setup, having a protective stop is the last line of defense that cannot be argued with! Our exact, preset stop prices are provided with every ETF and stock pick entered in our Wagner Daily swing trading newsletter,. Having a reliable strategy for picking the strongest stocks/ETFs to trade is important, but any trading system lacking clearly-defined money management rules is doomed to eventual failure. Never risk more than 2% of total account value on any individual trade (no matter how "great" the setup looks). Average risk per trade when conditions are optimal is 1-2%. This should prevent the experienced trader from ever losing more than 15-20% of his account value. New traders should risk a maximum of 0.5% per trade to prevent getting into trouble while learning. Do not take capital exposure of more than 25% to 30% of account per trade. Risk control should always be a trader's foremost concern. Losing trades are part of the business, but failing to honor stops will quickly knock you out of the game. Who Is This Swing Trading System Designed For? Our subscribing members are a diverse group of market participants, including semi-retirees looking to preserve and build their wealth, part-time traders seeking to supplement the income of their day jobs, and even professional financial advisors looking for solid technical guidance. Because our swing trade service is fully designed as an "end-of-day" trading system, even part-time investors and traders with daytime jobs may completely follow our strategy and swing trade picks by simply setting their buy and sell stop orders with their online brokers before going to work. Because our strategy for trading stocks and ETFs is based on technical analysis and price momentum, common techniques known to work all over the world, our stock trading strategy works equally well for any market in the world, providing members who subscribe to our trading system with unlimited opportunities for profiting in various global stock markets. If you are serious about becoming a consistently profitable trader, you need a trading system that works. To learn how to trade stocks based our proven swing trading techniques with an 11-year track record of success, sign up today for your 30-day risk-free access to The Wagner Daily or dramatically shorten your learning curve with the best swing trading video course around.